For those who follow the weekly vlog over on YouTube and the group over on Ravelry, you may know about the Patreon Supporter Reward tiers. 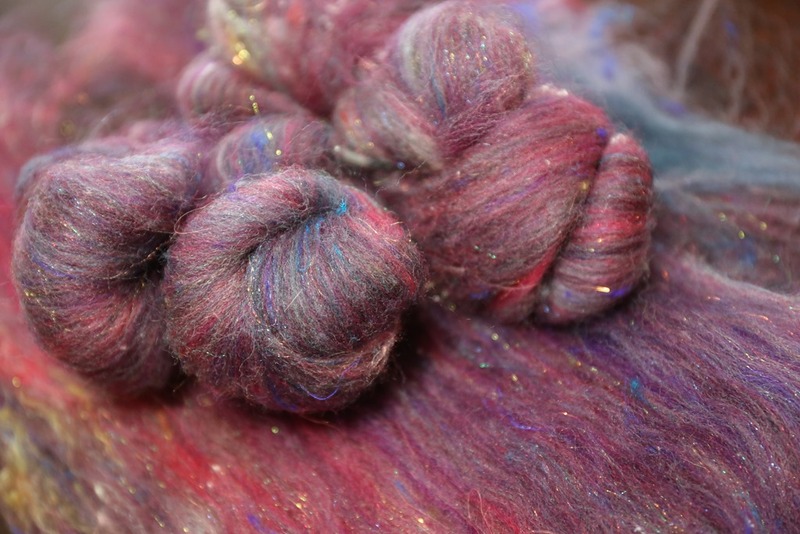 A couple of the reward choices include monthly 25 and 50 gram fibre mail-outs. I had some real fun in June choosing the first colourway to be mailed out in July, spinning a little sample after it was all packed up and ready to be mailed. One Sunday morning in late June, Norah fell asleep in the car so I sat in our tailgate – we have a station wagon – and spun up the reward fibre. Some of our neighbours came and went during that hour that I was sitting there – I’m sure they were wondering what I was doing. I was so into spinning that I just kept spinning and completely ignored them! Oops! The time spent sitting there was also a chance to try my Bosworth Midi for the first time as it had been sitting on my self collecting dust while I finished other projects throughout the month. The inspiration for July’s colour came from looking at some of Norah’s clothing that doesn’t fit her anymore. Being 2 years old, she tells me everyday (because I might forget) that her favourite colour is purple. In the donation pile were two sweaters that I debated about giving away. They are so worn, from washing and wearing, that I thought maybe I should throw them out. After inspecting them for a while, there was nowhere in the fabric that appeared thin and no holes. The colour had faded, that was all. 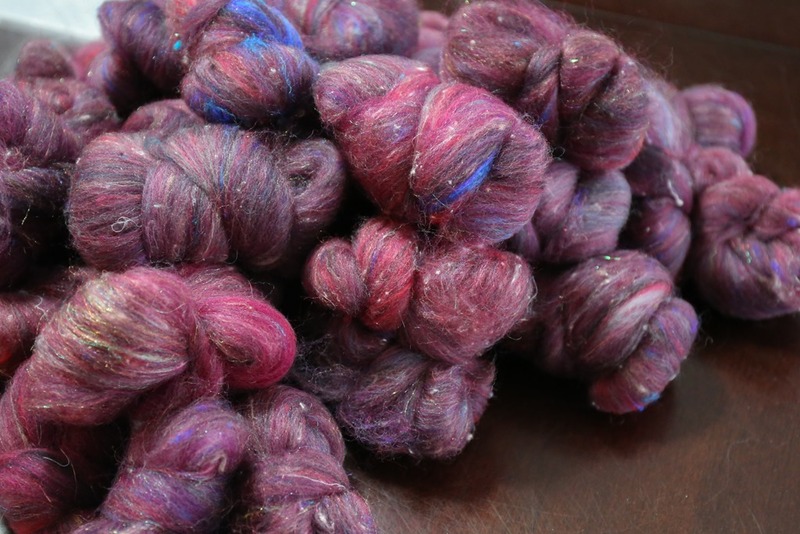 They were both variations of purple and I decided to re-create the colours in this month’s fibre package to remember these fleeting days of my kids being ‘small’! 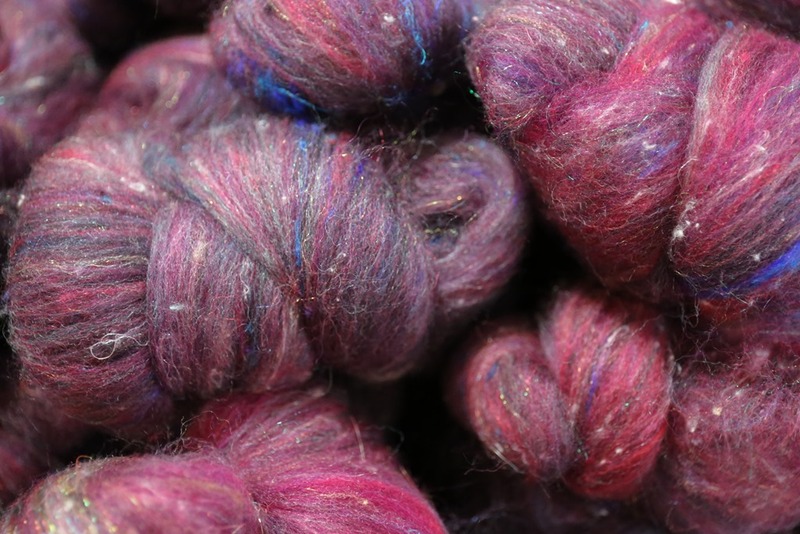 July’s fibre came in the form of mini-batts or nests of carded fibre. I consider these textured as there is a complete mix of fibre and content, including Perendale, Merino, SW BFL, Silk Noil, pulled Sari Silk, Sari silk (threads), Silk and Corriedale. The colours I included were maroon, black, bright lavendar purple, mauve, robin’s egg blue, and royal blue and purple, which creates an overall red-purple colour – exactly the colour of Norah’s sweaters. 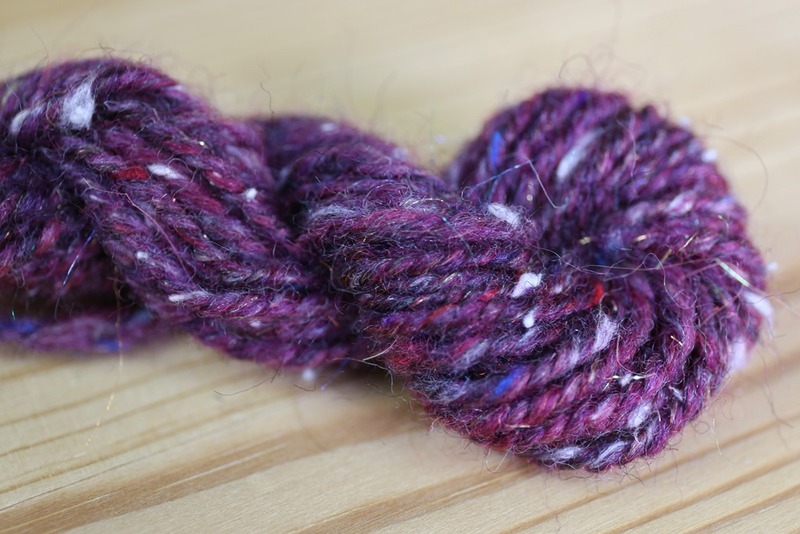 The finished skein is textured and interesting, with depth, bright colour and interesting contrasts. Spinning this on my Midi, which is 28 grams, I was able to get some good twist into it. To ply, I started with a small bracelet and I ran the spindle down my thigh while plying to get the matching twist in the plied yarn. 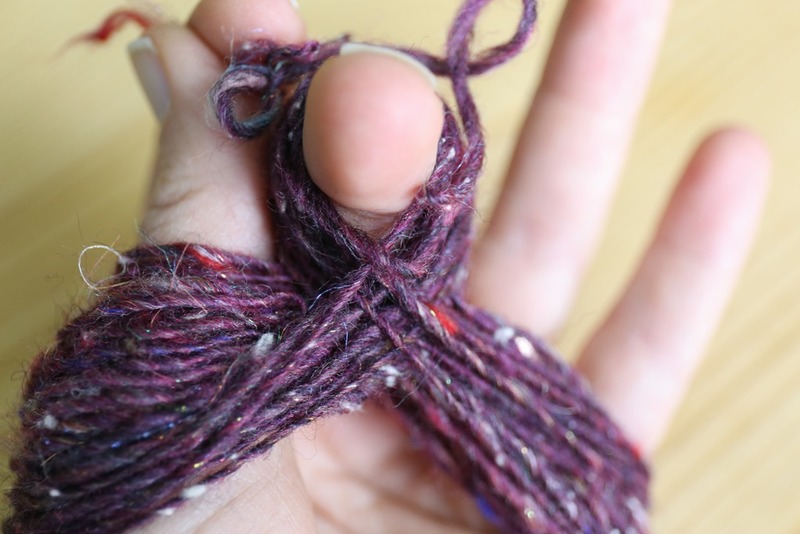 This higher twist helps to ‘lock in’ the textured bits, creating a slightly more durable yarn. For a knitted project, mittens would be glorious! A simple St st pattern would highlight the texture in the yarn with the durability of the high twist. How are you going to spin your nests of fibre? 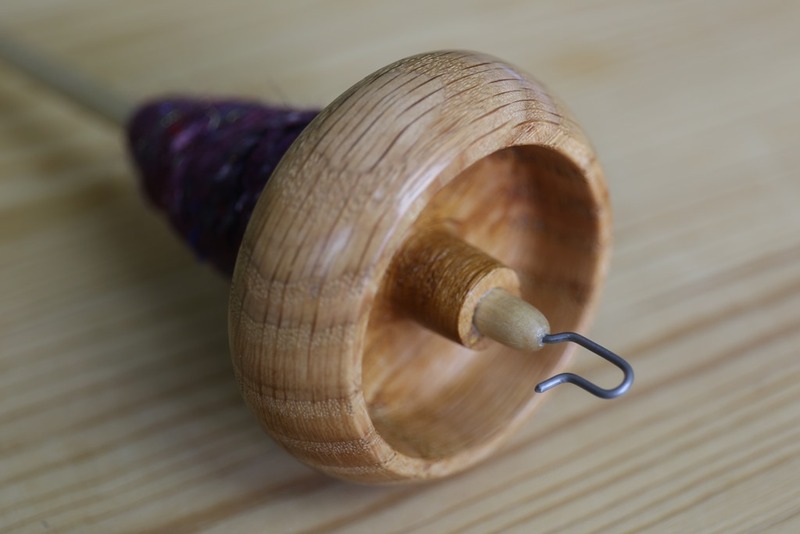 Please share and remember to use #woolnspinning so we can see what you’re making! Interested in learning more about the monthly Patreon support fibre? Head on over here. There is still space available!